Dr. Gunni, aka Gunnar Larus Hjalmarsson, is pretty much the de facto guru of Icelandic popular music history. He’s been an “insider” in the scene for decades both as a fan and a musician, having played in his first ever concert in 1980 with the band Dordinglar at the ripe old age of 14, opening for established punk rockers Utangarðsmenn and Fræbbblarnir. He’s been in a number of bands including Bless, Unun, and one of my favorites S. H. Draumur, almost became a member of HAM, and has been involved in projects with Björk. Most recently he put out a children’s album called Alheiminn. To say he knows the Icelandic music scene would be an understatement. 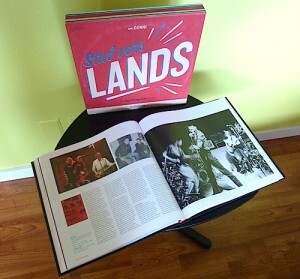 In 2012 Gunni released Stuð vors lands, a beautiful, massive coffee table book about the history of popular music in Iceland. It’s a big hardback in a sturdy slipcover, 442 pages full of high quality photos that trace the development of the scene from about 1900 forward. Stuð vors lands was released during Iceland Airwaves last year and Holly and I attended the book launch party at a Reykjavik book store, which included a who’s who of 1980s Icelandic music and featured live performances from a number of former greats. Despite the price (this is a high quality, low print run product…) and the fact that it’s written entirely in Icelandic (which I don’t speak), I picked up a copy because if for no other reason the photos made it worth it. Plus if I get really ambitious I can always type some text into Google Translate and see if I can make sense of what it gives me (not always easy). I looked at it as a sort of “must have” for someone interested in Icelandic music. When we were back in Reykjavik this April I heard Gunni was working on an English language version of Stuð vors lands so I sent him an email and offered to help if there was anything he needed. He got back to me right away and while he didn’t need help with the project I ended up over at his place and bought a few items from his record collection that he was just about to start selling off. Timing is everything! 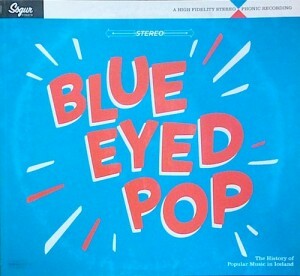 It was also at that meeting that I found out the new project would be called Blue Eyed Pop and would hopefully be available for Airwaves 2013. I was excited, to say the least. Sure enough, the somewhat smaller (but still oversized) softback Blue Eyed Pop was all over Reykjavik at Airwaves this year and I made sure to pick up a copy. As near as I can tell it’s more or less a condensed version of Stuð vors lands, about half the length at 220 pages but still covering the entirety of the country’s popular music history. It’s heavily illustrated (most if not all the photos also appeared in Stuð vors lands) and provides a history that is both wide-ranging and concise. The period of most interest to me, from the start of the punk movement circa 1980 to the present day, is roughly 60% of the book, so there are ample photos, anecdotes, and band histories to keep me both informed and entertained. There are some cool added features as well, such as a music history map of Reykjavik and a number of various lists of the top rated and top selling Icelandic albums of all time, useful for someone looking to dip their toes into earlier material. In reading Blue Eyed Pop a few common threads in Icelandic music seem to weave in and out. Up until around the late 1970s bands tended to rely fairly heavily on covers, something I’ve noticed on the handful of older records I’ve tracked down over the years. This makes some sense when you think about living in a very isolated place in the pre-internet days, when much if not most of the new music coming to the island came from American armed forces radio and Icelanders who traveled overseas and brought music home with them. Their exposure was to the hits, which makes it harder to develop a broader scene. The second part is the drive to leave Iceland and find wider international success, which often resulted in bands touring the smallest clubs in the UK or the US, playing in front of sparse crowds and surviving on near starvation diets. Fortunately today it is simple both for Icelanders to access music from the rest of the world, and to share their amazing bands as well. when you’ve gotten bored with the internet). Musician Mugison thinks the island’s isolation also contributes to the uniqueness that each band seems to bring to the table. because then you’re forced to at least try to make your own voice. Blue Eyed Pop is the perfect resource for the English speaker who wants to learn more about the history of music in Iceland. Gunni maintains a brisk pace, so even if you’re not interested in the band you’re reading about at the moment, give it a couple of pages and you’ll be learning about something new. The only other English language book length treatment of the subject I know if is Paul Sullivan’s Waking Up In Iceland: Sights and Sounds from Europe’s Coolest Hotspot (2003), though that takes a somewhat different approach (though I do recommend it as well) and is really a compliment to Blue Eyed Pop. The one criticism I have of the book is the lack of an index (Stuð vors lands has one, as does Sullivan’s book), which would make it easier to find info on specific bands and albums as a given band might well appear in multiple chapters. That being said, I highly recommend it for both the casual and serious fan. Takk, Dr. Gunni! This entry was posted in Book Review, Iceland and tagged Blue Eyed Pop, Dr. Gunni, Icelandic Music, Music, Stuð vors lands by Administrator. Bookmark the permalink.